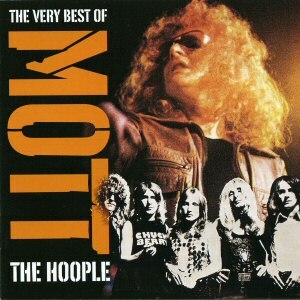 Mott The Hoople CD: "The Very Best of Mott The Hoople"
The answer lies in the way music retailing works. Once an item has been stocked it seems stores won't restock regardless of how an item sold (unless you're a megastar like, say, Elton John). Repackage an item, however, give it a new title, juggle the tracks around and suddenly the stores are more likely to be interested. Hence this compilation, released to cash in on, er... I mean coincide with Mott's five-night run of reunion gigs at London's Hammersmith Apollo in 2009. This is actually quite a good compilation. It's got all the hit singles on, some good album tracks and a small but fair selection of Island-era material (which normally gets overlooked on compilations like this). Hence One Of The Boys, All The Way From Memphis and Roll Away The Stone (and indeed Rock And Roll Queen) are the single versions rather than album versions. Album tracks like Walkin' With a Mountain and The Moon Upstairs show that Mott could rock out with the best of them, while Waterlow and Ballad of Mott show a softer side. Marionette and Crash Street Kidds also show that the 1974-era Mott hadn't lost its edge. All the hits, good album tracks, no filler, excellent sound quality as well as good sleeve-notes. I can't fault it. If you're looking for an introduction to Mott The Hoople, this would be a good place to start.